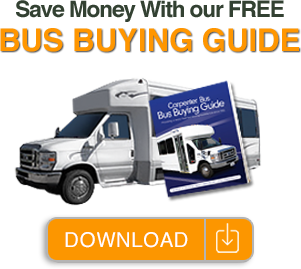 Carpenter Bus Sales is one of the only bus companies in the United States that offers our customers bus rentals. If your organization or church needs a bus for a trip and has the proper insurance coverage, we can rent your organization a bus. Due to the strict insurance requirements of bus rentals, most individual customers do not carry the required coverage. For example, our insurance requirements for churches, schools and nursing homes begin with $1M worth of auto coverage as well as $1M worth of excess umbrella coverage for any and all bus rentals. Transit companies require $1M in auto coverage and $4M in excess umbrella coverage. Don’t make your passengers ride in a tight, uncomfortable van when they can ride in more comfort in one of our rental buses! If you need to rent a bus, our terms start at 1 day rentals and can go on up to 3 months. Our bus rental fleet includes vehicles ranging from 15 passengers on up to 44 passengers. Our buses come with both rear storage and without. Our rentals are the best way for your group to travel in comfort. Most of our rental buses are equipped with reclining seats as well as overhead luggage. Some of our buses have extra amenities like a PA system for easy communication with your group along with TV/DVD packages which make longer trips much more fun. Our rental buses must be picked up and returned from each originating location. If you have any questions regarding pricing, availability, or insurance requirements contact: Amanda Crawford for rentals originating out of Tennessee AND Shanna Nichols for rentals originating out of Texas.